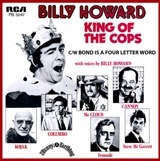 Christmas was always a time for novelty songs especially during the seventies and in 1975 a song made the chart which was the first record broadcaster Jeremy Vine bought, he said, “It was Billy Howard’s King of the Cops – a spoof on King of the Road by Roger Miller with impressions of police officers like Columbo and Kojak. I played it and played it and took off every person. I wanted to be an impressionist.” Well he never went down that path, but did end up on television and radio. Let’s find a little about that first song he bought. Billy was born in Edgware, north London and by the age of five he was already showing signs of mimicry. At school he was often taking off his teachers which gained him parts in school plays and was singing solos in his local church. His father was a ukulele player and when Billy was 12 his father showed him three chords which gave him his interest in music, he continued to learn ukulele and was hell-bent on learning more after discovering the jazz guitarist Django Reinhardt. Two years later he took up guitar and trombone and ended up joining the school trad jazz band. He seemed to prefer music to impressions and so, at the age of 16, he turned professional and joined various jazz bands and then a leading south coast jazz combo two year later. The following year he decided to add a trumpet to his repertoire of instruments which led him to join dance bands and began working on ships across Europe. He eventually had his own five-piece band who were featured on many BBC radio programmes. Once he reached his twenties, Billy realised he wanted to be an entertainer. The north of England was generally the place where it was most successful and so was invited by an agent in Manchester for a try-out weekend which was so successful that he remained with them for a year. In his regular routine he began incorporating impressions of singers beginning with Max Bygraves and Frankie Vaughan. Because he played trumpet, he decided to add Louis Armstrong to his selection. Mike Yarwood was almost certainly an inspiration and one of Billy’s friends suggested doing impressions of television people and, by his own admission, decided to pick the TV cops Kojak, Columbo, Ironside, Frank Cannon and Steve McGarrett from Hawaii 5’O and upstage them all pretending, in the character of Deputy Marshal Sam McCloud, from the series McCloud, that he was ‘king of the cops’. The track, which featured accurate impressions and a number of catchphrases, was only made for a giggle and never intended for release but Penny Farthing records signed him and the song reached number six in the UK. The B side is well worth a listen too. It’s called Bond is a Four Letter Word and tells a little story of Britain’s best-known secret agent in a Roger Moore style. There was obviously a trend starting here because just four months earlier Jasper Carrott charted Funky Moped and Magic Roundabout, the latter being another all-spoken hit. Unfortunately Billy’s follow-up, Disco Cops, missed the chart completely and he remains a one-hit-wonder. On the back of the hit, Billy’s work load increased 10-fold and was soon topping the bill at some of the UK’s premier nightclubs including Cresta in Solihull, Wooky Hollow in Liverpool and Caesar’s Palace in Luton. By the end of the seventies, he became an in-demand voiceover artist for many television and cinema commercials.